Where is Castor? It’s here. I ended helping out put up some siding on her house as well as visit her over the weekend. Her dogs (Chihuahuas) were a funny pair. They would lose their minds, barking at me when I either entered the house or got up from my chair, if I knelt down to let them smell me, they would stay back and still bark. Yet when I was sitting, I was their bestest friend, and favourite spot to sit. 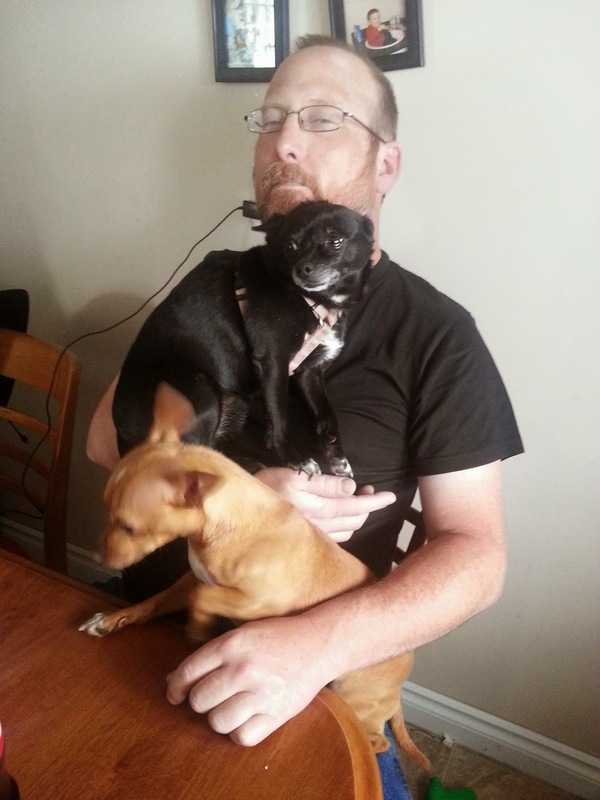 (Here is me with my personal, vicious guard dogs). Castor is a nice, typical, small prairie farming town and I regret not getting more shots of it. Overall it was a clean and well-kept small town; yes even the trailer park was ordered and neat. As you probably know most of the small towns across the prairies are founded around the railroad and the grain elevator, Castor is no different. It was nice to see her and her place after so long. Her kids are getting big (they tend to do that). Unfortunately that: good cooking, country air and my tendency to wake up early meant that pretty much I went to bed when the kids did and woke up at (gasp) 6:30 . . . (what a sloth I am). It seems that Ace won’t charge up to the point that the charge controller won’t kick out (say that it is fully charged). Yet, Ace’s own battery reader says he is charged, so I give up. I am using him this morning, charge him today, and hope that he will be charged by morning. The trip to Castor and back took a full tank and so I went to my favourite place to get fuel. It is a big-box wholesaler which is open to the public (with a membership). It also sells fuel and is usually the cheapest place around. By the time I got there last night the store and gas station were closed (I figured as much) but the hours on the sign indicated that they would be open in the morning with plenty of time for me to fill up and get to work. Since I also needed propane (yet they don’t sell it) I filled the propane tank at a nearby gas station (which was 5 cents a litre higher) and decided to camp there for the night. I found the most isolated spot in the massive and vacant parking lot and got ready for bed. I was in bed and dozing off at 10 pm when there was a knock on the door informing me “we don’t usually allow people to camp overnight on our premises, but I believe that [well know big box retailer] encourages that.” I did what I always do, defuse the situation and deal with it, its instinct, I’m a problem solver. As I was driving away, that was when the indignation and anger hit me. I wasn’t hurting anyone, I didn’t strike up the barbeque, set up a portable fire pit, have a party or anything; I was asleep (well, almost). If it wasn’t for the fact that their fuel was that much cheaper, I wouldn’t be back, especially this morning. So I am parked this morning in the parking lot of a nearby big box retailer. I didn’t get any writing done, this weekend but I will get back to it now. Take care, all.